OK, pics. I didn't take as many as I thought I had this year, but let's start off with the obligatory group pic. If I have any names wrong, please let me know & I'll correct this post. I'll be looking to pick up a transatlantic this side of xmas too I think...! A few guitar pics. The auto exposure on my camera doesn't seem well suited to guitars & they are all a bit over-exposed, which is a shame. But it was too cold outside to spend ages messing around with it! Bacchus BLS95 P90 GT - late '90s? new Tokai LS160S GT - available for purchase from Richtone. early 80s (?) Tokai Breezy TE120 (Fender decal) - modified! Bacchus Vintage Series Tele BTE 67 BG - late '90s? It's hardly worth posting this next one due to overexposure, but it does show the difference between the usual Tokai rosewood cap board & the slab board that (for some reason I can't work out) Tokai fitted to the Goldie ST80s. The sound clips from the last convention proved to be popular, so we repeated it this year. There were only a handful of guitars there that didn't get a workout on video. Tom filmed them all, & will no doubt load them onto YouTube when he's sorted them out - there are quite a few! New member Andre volunteered to play them all for us, & he played for around a minute on each guitar, trying to demonstrate each pickup setting in turn. He played similar stuff (very nice too ) each time, so hopefully the videos will be a useful demonstration of how similar guitars with different pickups actually sound. Tom's Silverface Fender Pro Reverb (is this for sale Tom?) was used for all the tests (except for the 335 types), & I believe that Andre kept the amp settings the same each time. 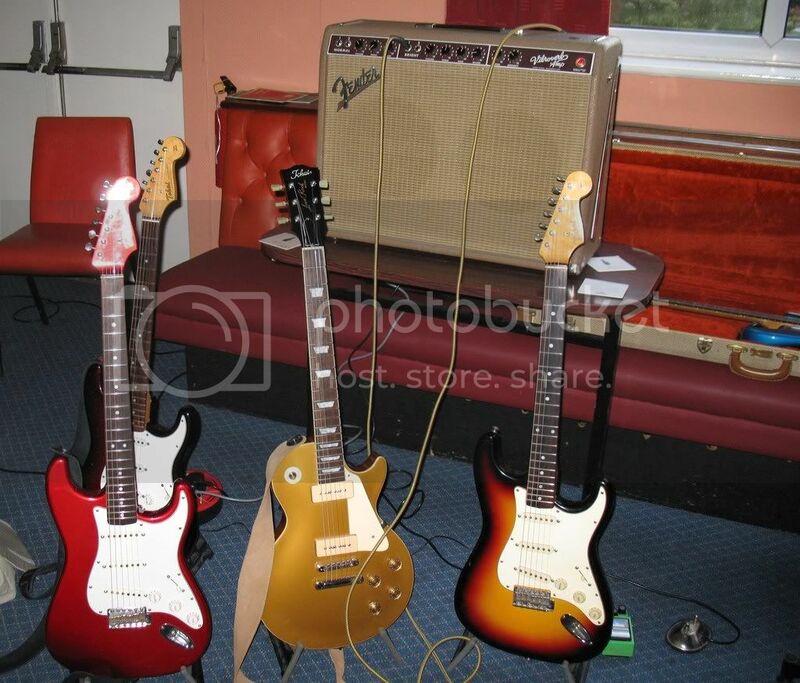 For some reasons, none of the Strats or Teles needed to be tuned, but all of the Les Pauls did! Here's John supervising the tuning. Gabe & Alan discuss various Gibson-y type things. 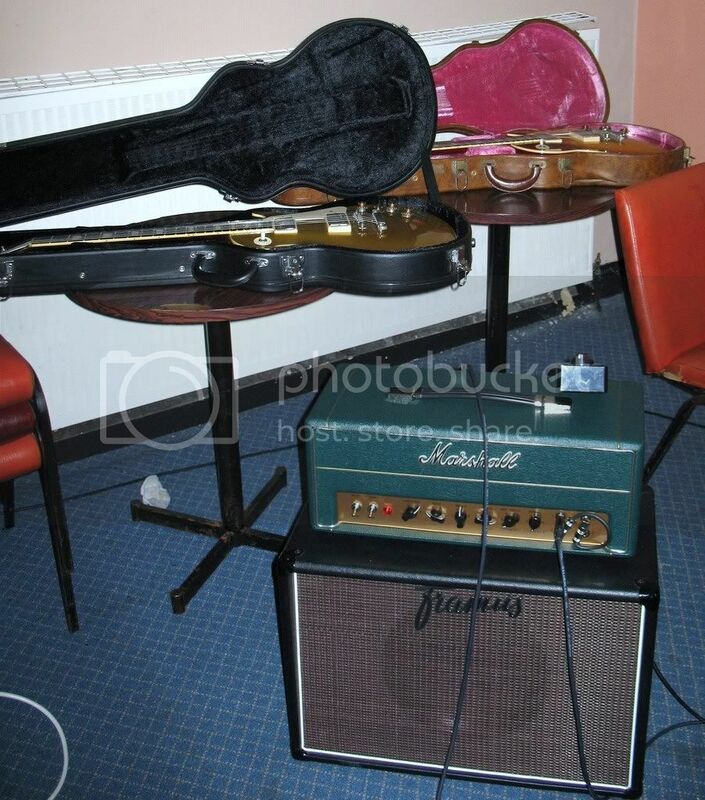 Rich from Richtone and the gear he brought with him, including the amp which has already been discussed. It was good to meet Rich, but he does seem rather young for a Wishbone Ash fan, doesn't he? All 4 guitars & the amp are available for purchase from Richtone. 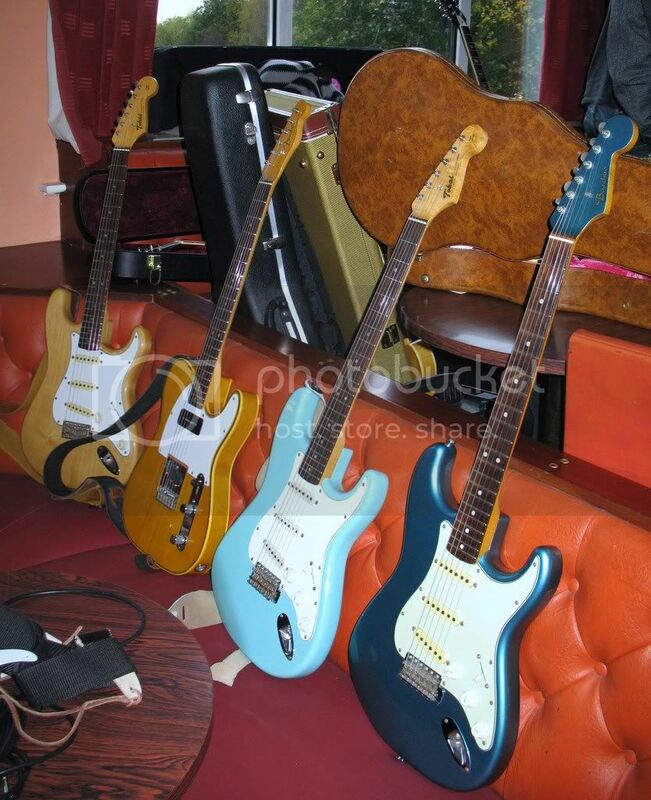 Foreground - a selection of mine & John's guitars, + Gabe's pint. Behind them, on left, Alan's mate Adrian chatting to small boy belonging to the venue. On the right, Tony & Dave chat (facing us), while Gabe & Alan chat behind them. That's your lot from me folks. Bob from Tokai Europe thinks he should be able to attend. Huzzah! So what happened to Tokai UK? That's two in a row they've missed, & they're only in Sheffield! This year we had people travelling all the way from Norwich, London & Slovenia! Not sure Mike - I've mailed him a question about a fakai so he might mention it in his reply. I didn't take many pictures either....just a few duplicates of Mikes plus these assorted indoor pic's. Johns very nice sounding & looking home built 18 watter. 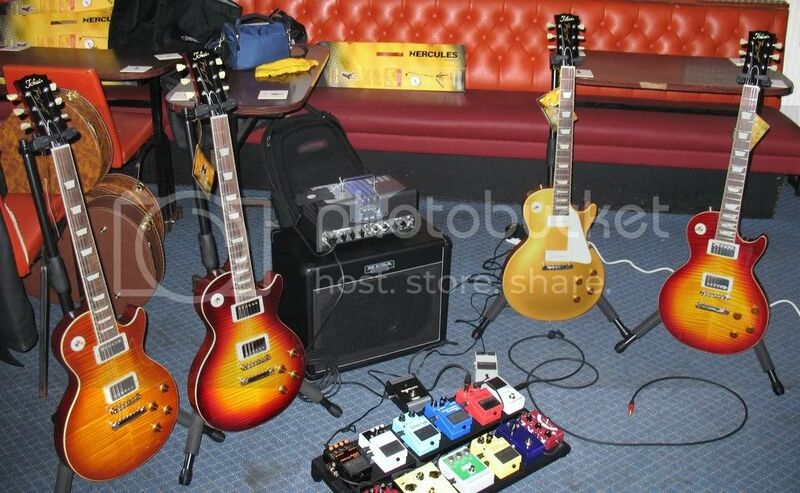 plus a slightly better pic of Rich's Tokais, much coveted Mesa Boogie Transatlantic & Johns pedalboard. Hi all, it really was a great day. Many thanks to Andre/EZRider for demoing most of the guitars. I've got the first video up on youtube just to try a different upload format. I'm way out of my depth with all the different codecs, mpegs and formats and it's taking nearly 20 mins to upload. I'll have the other Teles, Lesters and Strats posted by the end of the week. 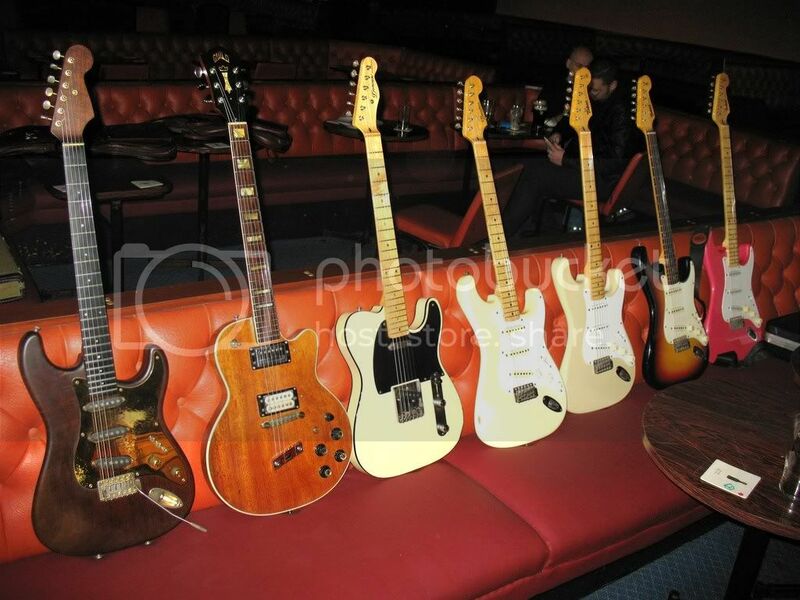 Great to see the faces and guitars 'old' and new! Sorry I wasn't able to make it. BTW - Leeds is great city, definitelly worth of spending couple of days there. I was most impressed with Mesa Transatlantic and LS370, man, I really need to put this on my Christmas wishlist Santa, can you hear me? I took couple of pictures but nothing really special, you guys allready shows everything. BTW - Leeds at night after Tokai show was really great, I didn't drink as much beer in a year! Thanks againg guys for great show and great company.